The Painting Center is pleased to announce the first exhibition of its new member, Patrick Webb. For his inaugural exhibition, Mr. Webb has invited David Carbone and Nancy Grimes to exhibit with him. Rather than segregating the Project Room from the Main Gallery, the artists have elected to divide both spaces equally. 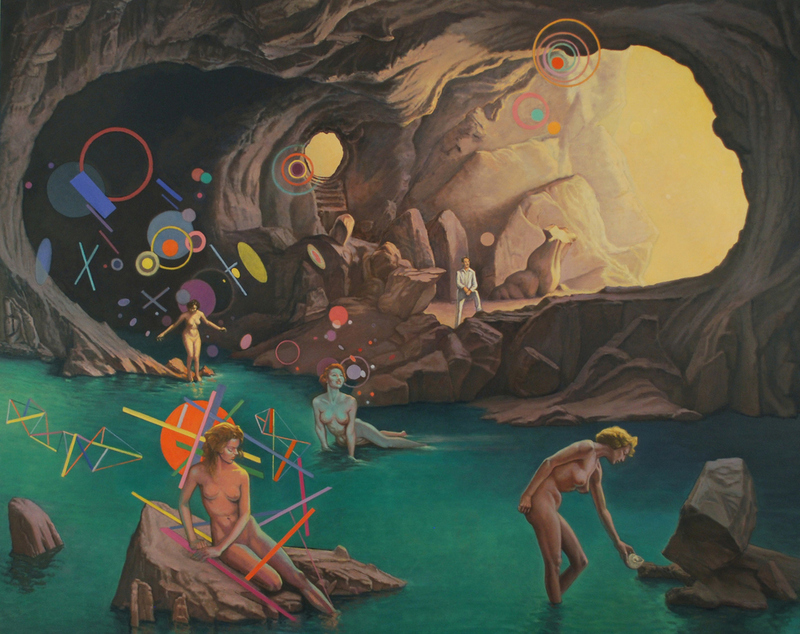 David Carbone paints figures in invented worlds infused with a mood of disquieting strangeness. More inscapes than landscapes, these paintings meld aspects of figuration and abstraction. The familiarity of the figures contrasted with the unfamiliarity of their surroundings jars our expectations into considerations of meaning. Working with memories, myths, current events, and the lives of others, Carbone imagines fictions on the fragility of the self, exposed and incomplete. Eros and Thanatos are everywhere. Less windows on the world than mirrors of the artist’s consciousness, these images trace the shadows that betray the “unreality” of everyday life. David Carbone has written on art for Modern Painters and The Sienese Shredder. Nancy Grimes’s still-lifes are filled with fakes—wig forms, plastic flowers, decoys—that serve as stand-ins for real things. Objects are not scattered randomly but are strategically positioned to create meaningful relationships. Unfolding slowly, the paintings are meditations on the vulnerability of the body and the experience of mortality. Grimes carefully observes objects, then imbues them with specific rhythms and qualities that create a kind of visual counterpoint. Everything fits together. The paintings’ mysterious softness and pristine continuity of surface and space create a world that is both familiar and unfamiliar. Nancy Grimes has written reviews for ART News and Art in America, as well as a monograph on the American symbolist Jared French. Patrick Webb’s paintings are of the City. His large-scale figure compositions include his ubiquitous Punchinello figure in ordinary activities of the city—on a phone, unloading boxes, or walking. Punch’s presence moves the paintings into the realm of both allegory and spectacle—Punchinello’s origin is in the theater—where symbol and narrative push familiar experiences to realms of strangeness and significance. The painting Punchinello as Leporello takes its narrative inspiration from the Mozart-Da Ponte opera Don Giovanni. The smaller cityscapes, painted from Webb’s studio window, juxtapose the rhythms of paint mark, scumble, and smear with the structures of the building, rooftops, and sky. Not so much about a sense of place as a sense of moment, each painting explores a palette and a structure that informs the larger narrative figure paintings.